Building amenities can no longer get away with only being luxurious and exclusive. They have to be creative too. What may have started with options like landing pads for flying cars has now reached a much younger demographic—the kids of those who live in the building. 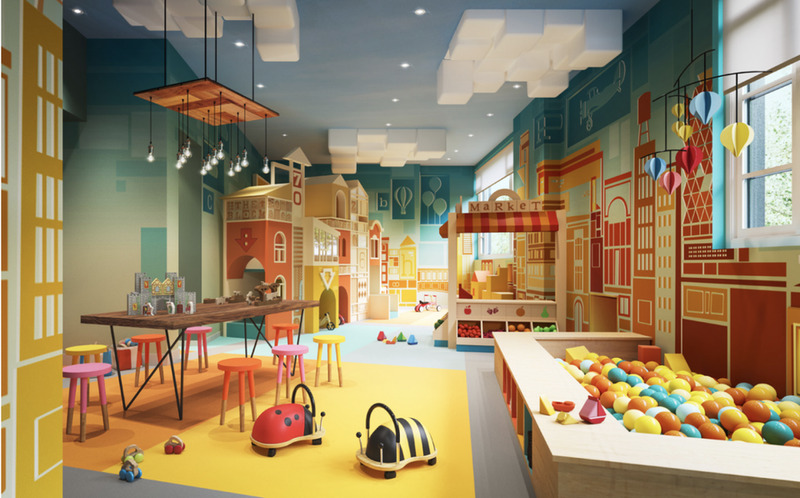 Developers are bringing in renowned architects, such as David Rockwellwho designed the playroom in New York’s 111 Murray Street building (above) to create a sophisticated aesthetic to previously overlooked spaces. Besides making the gathering rooms feel as high-end as the multi-million dollar condos in the building, developers have also raised the bar on the activities. Educational electives that augment the school curriculum, especially STEM-themed topics, are becoming a weekend staple and the options for how kids can burn off their energy are enough to make the parents more grateful than ever before. The use of the vertical space within each building has become even more valuable and communal spaces for the young ones have not escaped the trend. Playrooms are taking full advantage of height, such as the LEGO wall at the Elysee in Miami as seen above. The design seen here also shows the growing use of having glass wall dividers so rooms for different aged kids can be separate but still within view of each other for parents to keep an eye on everyone. There are also more and more kid-friendly climbing walls being installed, such as the one at The Shephard (below). Climbing Wall and basketball court. 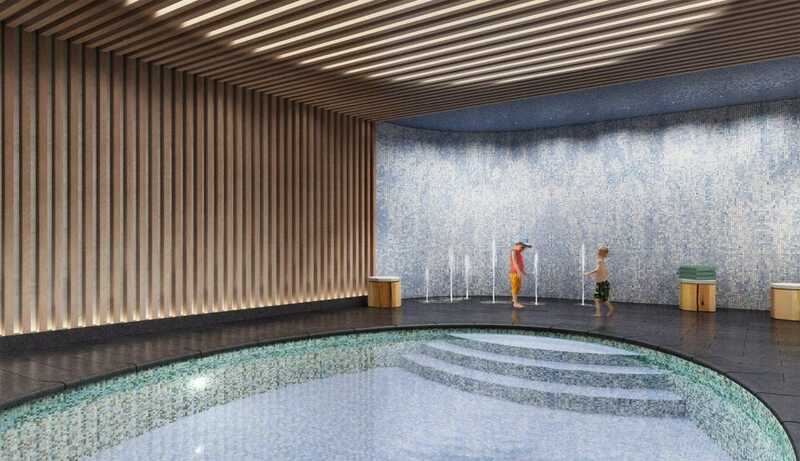 The 111 Murray Street building has an indoor splash pool near the building’s main pool and the David Adjaye-designed 130 William building has a three-zone trampoline room. 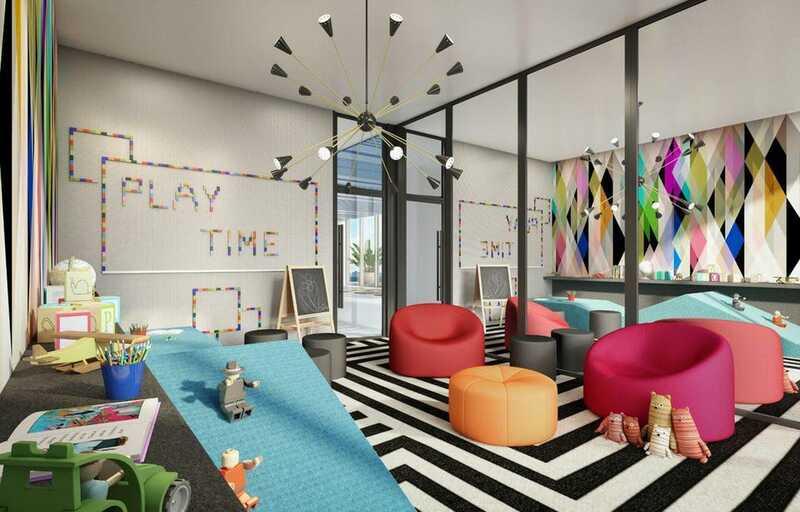 Developers have even incorporated the branding of the building in the kids’ amenities options, such as the butterfly-shaped climbing frame at 11 Hoyt that ties in with the pollinator-friendly private garden for the building’s residents. Architectural touches don’t get left behind when it comes to kids amenities, as the herringbone floor pattern and clerestory windows in the trampoline room at 130 William show. 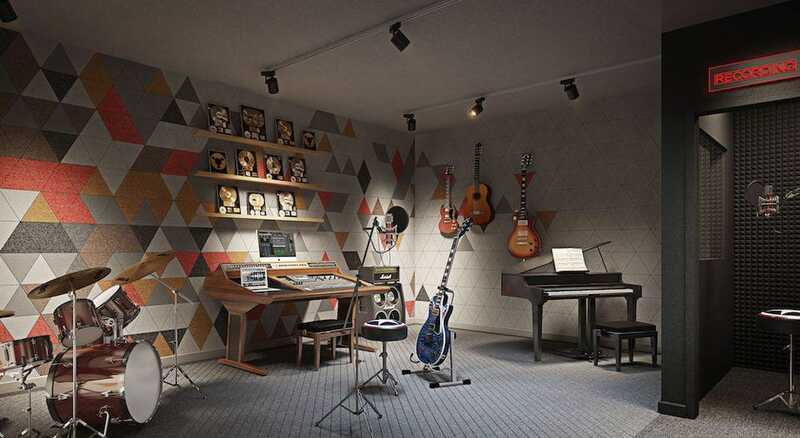 A few years ago one of the newest trends was to have soundproof jam rooms so residents could have band practice without offending the whole building. That perk has now upgraded itself to include a recording studio, as seen in the building at 250 W. 81st. Besides the commitment to physical activity there is an increased trend of bringing extra-curricular classes and learning on site. The Chatsworth has partnered with the Brooklyn Robot Foundry to have STEM/STEAM workshops for kids to build their own robot-powered toys and household items. Related Rentals has partnered with GooRoo, an AI-driven tutoring and learning program partner of the New York Department of Education, to provide educational support and enrichment for the young residents. Beyond robots and LEGOs, beyond climbing walls and recording studios, it is the architecture and design that has risen to greater importance. 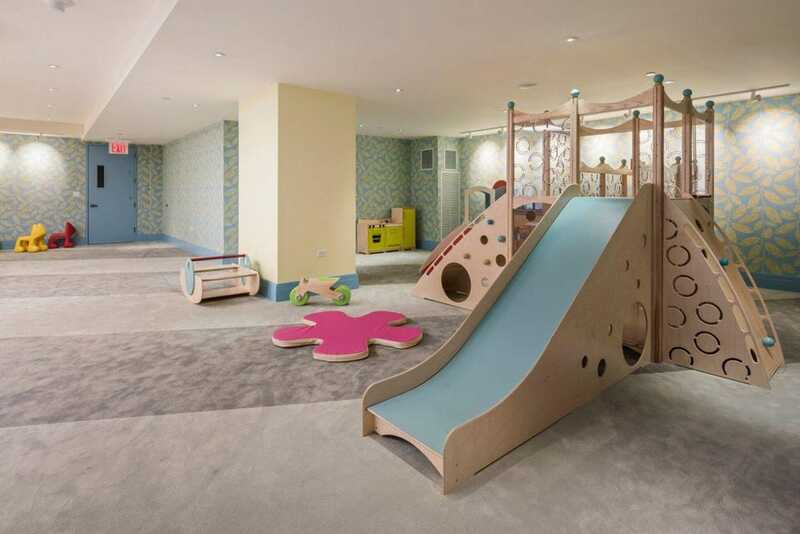 70 Vestry (where one of the country’s most expensive homes for 2019 sold last year for $55 million) has designed a colorful playroom one might find backstage at a circus (see above). 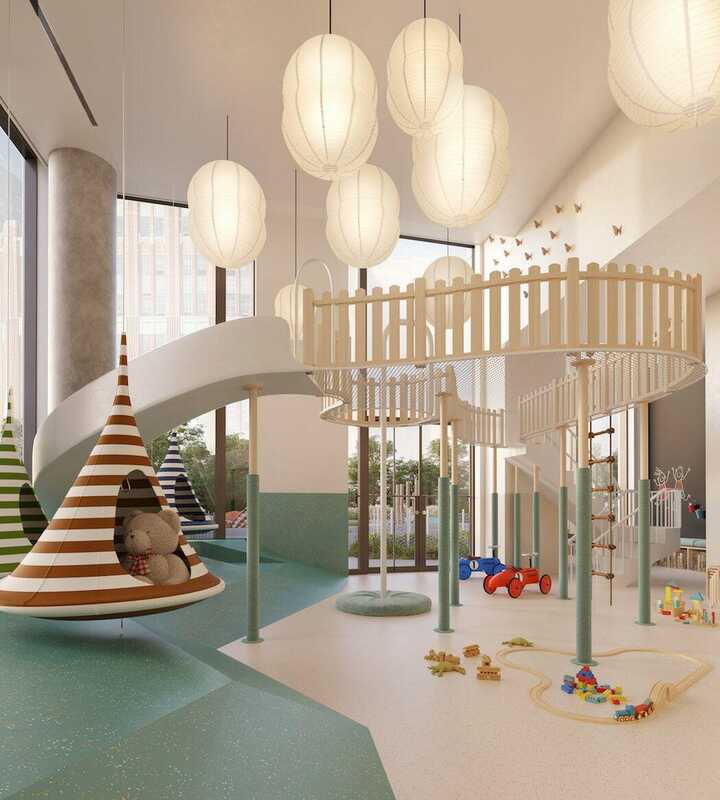 Tribeca’s 100 Barclay has partnered with the neighborhood’s professional play specialists Playgarden to create the indoor interactive space (below). The building at 11 Hoyt is another one whose design uses as much vertical space as possible with a raised mesh climbing space and chairs that swing from the ceiling. Taking advantage of vertical space has reached kids playrooms. And perhaps the most important design of all is the glass wall at The Harbour in Miami between the adults’ exercise room and the playroom so kids and parents can stay within sight of each other. 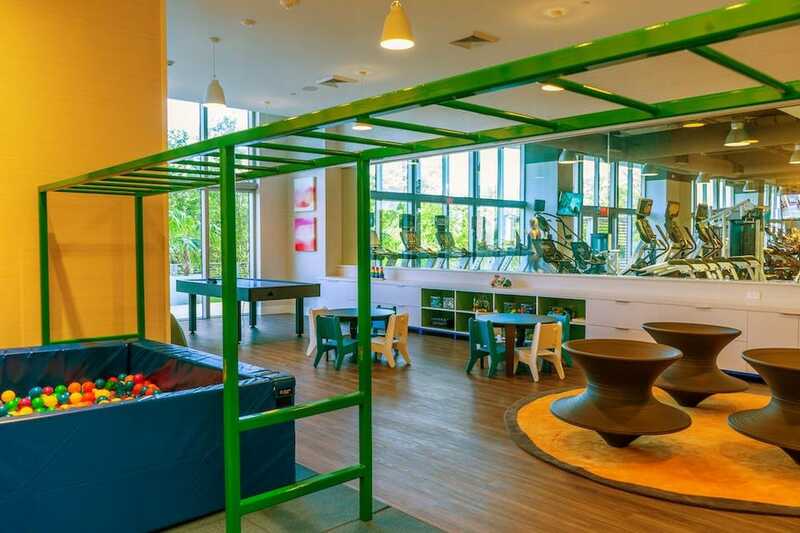 Glass walls divide the gym from the playroom at The Harbour in Miami. Designers haven’t forgotten about the outdoors either. The large splash zone at Panorama Tower in Miami has views of Biscayne Bay and Brickell is as appealing as the nearby pool. 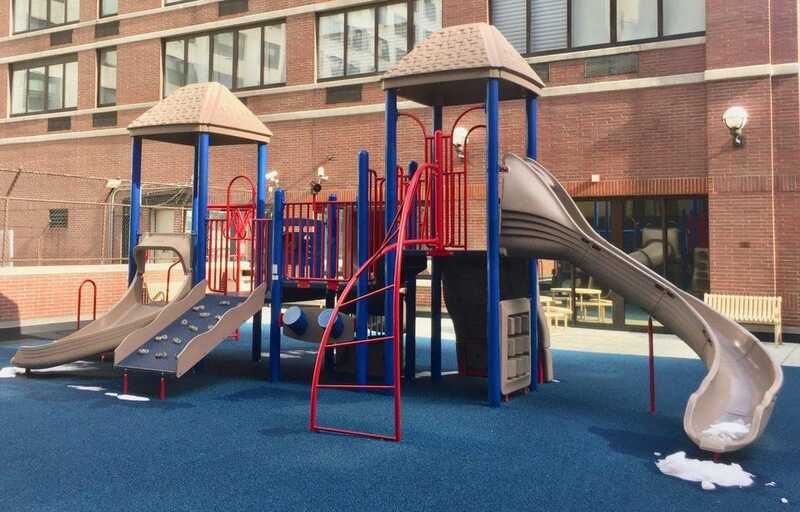 Or at The Oxford at 422 E. 72nd Street there’s a jungle gym that would rival anything found on a school playground. 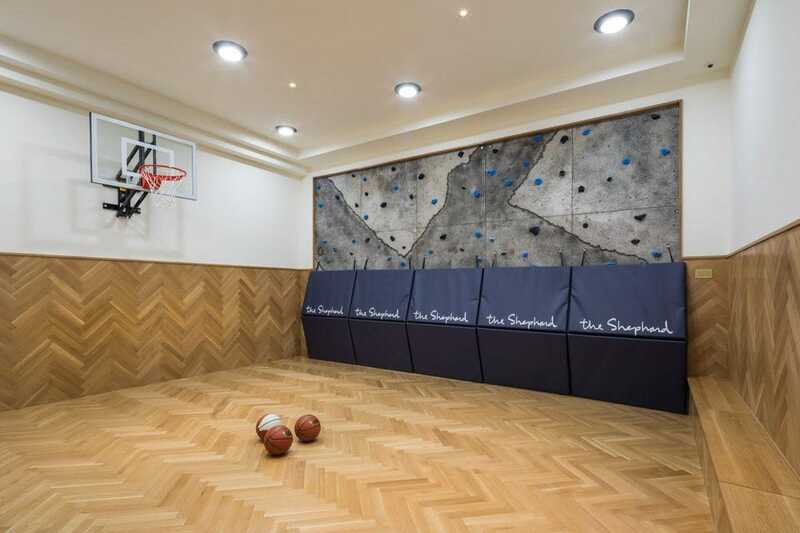 This is in addition to the full-sized basketball court, indoor children’s playroom and swimming pool.